Green Electronics? Not Quite Yet. And Where is Apple? Greenpeace last week released the results of its third-annual green electronics survey – a look at how leading electronics manufacturers companies are doing. All but Apple and Phillips of the 21 companies contacted agreed to be ranked on three criteria; removing toxic substances, responsible take-back of their end-of-life products and energy efficiency. 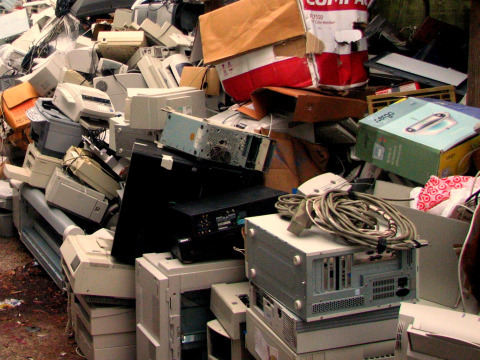 The survey was motivated by the fact that throughout a product’s lifecycle – from material extraction to production, and from consumer use to disposal – electronic products have the potential to impact human health and the environment through the release of dangerous substances and energy consumption. China is the world center for processing IT products and that country’s environment is paying the price. Printed Circuit Board and battery power production especially create heavy metal pollution. Part of the problem is consumer demand for cheap products that don’t reflect the true cost of production – they don’t reflect the toll on the environment, on public and worker health. Furthermore, IT companies continue to produce goods that have obsolescence built in, which means we consume endlessly looking for the newest or better product, boosting company revenues but at huge environmental and social cost, that, again, is not reflected in the price we pay. The Greenpeace survey found a general improvement in green features compared to the previous two surveys in 2008 and 2007, including a significant decrease in use of hazardous chemicals and almost all products met or exceeded energy efficiency standards. But lifecycle management was still the weakest point, with very little use of recycled plastic, varying take-back practices and few marketing efforts to prevent fast obsolescence of products. Generally, also, Greenpeace found that electronics companies were becoming more transparent in the amount and type of product information provided to customers, often listing product’s chemical make-up and performance details. Apple and Philips, however, once again refused to disclose any information to Greenpeace. Of course this reluctance to provide information is disappointing and not limited to probing by Greenpeace. Beijing-based IPE, led by environmental activist Ma Jun, has also over the past year focused on the IT sector for its significant contribution to environmental degradation in China. IPE has also contacted electronics companies about environmental violations and Apple is among those refusing to address questions about noxious emissions by factories producing its products. Writing in a Guardian blog earlier last year, Ma Jun said 34 Chinese environmental organizations, including Friends of Nature, the Institute of Public and Environmental Affairs, and Green Beagle, questioned heavy metal pollution produced by companies in Apple’s supply chain in a letter sent to CEO Steve Jobs. Last week Ma Jun said that the only response from Apple has been a demand for proof that the polluting factories are producing electronics for Apple. By contrast, in an interview with Asia Water Project last year Ma Jun praised Hewlett Packard and Samsung for duck disclosure and movement toward greener products. Indeed, HP and Samsung were among the companies singled out in the Greenpeace survey for the producing some of the greenest products. Why single out Apple, as IPE has done? Does a company with a solid reputation for being on top of its game, for producing innovative, quality and well-designed products, have a responsibility to manufacture without excessive environmental and social cost? Shouldn’t Apple be a leader also in its production processes and not a laggard? Should we as consumers not demand more from the companies that sell us our products? Fortunately, consumers ARE beginning to taking note. Companies that fail to adapt are poised to suffer huge reputational and revenue losses as a consequence. A game-changing opportunity awaits those companies that choose to meet this challenge.